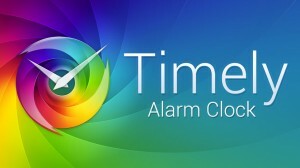 Timely is for many the best alarm available for Android devices. Until now, you could buy the premium version for a few dollars in the form of in-app purchases, but from now on, you can get it free. Timely is basically an alarm, with a very careful design and a high degree of customization. In addition to lots of themes to choose from, this application has many other useful features. For example, Timely supports Google Now voice commands, and it has a practical system implemented of clicking and dragging to set alarm times. The application has a lot of options to configure each alarm, from the type of sound and it’s duration to the way of turning off the alarm when it sounds. For those who have a hard awakening, Timely includes a collection of challenges, such as small visual puzzle or mathematical problems to ensure that we are awake before turning it off. Now, Timely offers complementary services that were until today in the form of in-app purchases, such as additional themes, more sounds and challenges, and the ability to sync to the cloud. If you don’t know this practice alarm yet, you can find it totally free on the Play Store.